Your day-by-day itinerary now includes Castle Hill. Your inner history buff will appreciate Fisherman's Bastion and Matthias Church. Do your shopping at Andrassy Avenue and Central Market Hall. The adventure continues: take in the spiritual surroundings of St. Stephen's Basilica (Szent Istvan Bazilika), step into the grandiose world of Buda Castle, get a taste of the local shopping with Vaci Street, and admire the masterpieces at Hungarian National Gallery (Magyar Nemzeti Galeria). To find maps, photos, traveler tips, and other tourist information, read our Budapest trip itinerary planner. Vancouver, Canada to Budapest is an approximately 15.5-hour flight. You can also do a combination of subway, bus, and flight; or do a combination of train and flight. Due to the time zone difference, you'll lose 9 hours traveling from Vancouver to Budapest. While traveling from Vancouver, expect a bit warmer days and about the same nights in Budapest, ranging from highs of 25°C to lows of 11°C. Finish your sightseeing early on the 7th (Tue) so you can take a train to Vienna. Give yourself a bit of retail therapy at Vienna Naschmarkt and FreyWille. Popular historic sites such as Belvedere Palace and Historic Center of Vienna are in your itinerary. The adventure continues: admire the masterpieces at Kunsthistorisches Museum Wien, examine the collection at Imperial Palace (Hofburg), admire the landmark architecture of St. Stephen's Cathedral, and take in nature's colorful creations at Schonbrunn Palace. To find more things to do, maps, traveler tips, and tourist information, read Vienna trip itinerary builder website . Traveling by train from Budapest to Vienna takes 2.5 hours. Alternatively, you can drive; or take a bus. In May, plan for daily highs up to 22°C, and evening lows to 11°C. Finish your sightseeing early on the 10th (Fri) so you can drive to Cesky Krumlov. Start off your visit on the 11th (Sat): explore the historical opulence of Cesky Krumlov Castle, contemplate in the serene atmosphere at Church of St. Vitus, explore the world behind art at Egon Schiele Art Centre, see the interesting displays at Moldavite Museum - Muzeum vltavinu, then get to know the fascinating history of Historie mesta Ceský Krumlov, and finally pause for some serene contemplation at St. Jost Church. Get ready for a full day of sightseeing on the next day: examine the collection at Museum Fotoatelier Seidel, examine the collection at Regional Museum in Cesky Krumlov, then step into the grandiose world of The State Chateau of Hluboká, and finally contemplate the long history of Minorite Monastery. 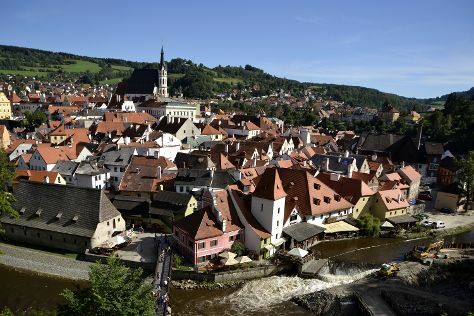 To find where to stay, more things to do, other places to visit, and tourist information, use the Cesky Krumlov tour app . Drive from Vienna to Cesky Krumlov in 3 hours. Alternatively, you can do a combination of train and bus; or take a bus. In May, daytime highs in Cesky Krumlov are 22°C, while nighttime lows are 10°C. Wrap up your sightseeing on the 12th (Sun) to allow time to drive to Prague. Prague Castle and Old Town Square are good opportunities to explore the local culture. Popular historic sites such as St. Vitus Cathedral and Prague Astronomical Clock are in your itinerary. Next up on the itinerary: get a taste of the local shopping with DOX Centre for Contemporary Art, snap pictures at Charles Bridge, look for gifts at Egoist Royal Parfums, and take an in-depth tour of Jewish Museum in Prague. For where to stay, more things to do, other places to visit, and more tourist information, read our Prague travel website . Traveling by car from Cesky Krumlov to Prague takes 2.5 hours. Alternatively, you can take a bus; or take a train. In May, daily temperatures in Prague can reach 20°C, while at night they dip to 10°C. Finish your sightseeing early on the 17th (Fri) to allow enough time to drive to Berlin. For shopping fun, head to Boxoffberlin or Rausch Schokoladenhaus. 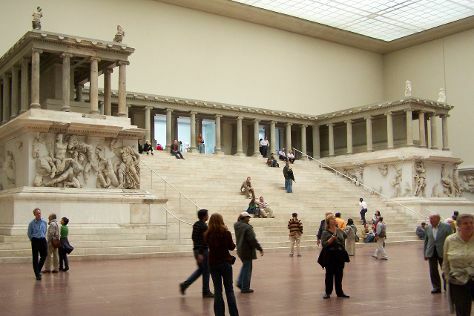 Pergamon Museum and East Side Gallery are good opportunities to explore the local culture. The adventure continues: step into the grandiose world of Charlottenburg Palace, hunt for treasures at Mauerpark Flea Market, steep yourself in history at Memorial of the Berlin Wall, and don't miss a visit to Mauermuseum - Museum Haus am Checkpoint Charlie. To find where to stay, other places to visit, ratings, and other tourist information, read Berlin trip planner. Traveling by car from Prague to Berlin takes 3.5 hours. Alternatively, you can fly; or take a train. Finish your sightseeing early on the 22nd (Wed) to allow enough time to drive to Wroclaw. For shopping fun, head to Renoma Shopping Mall or Sky Tower Wroclaw. On the 23rd (Thu), plan a day focused around Market Square (Rynek). Next up on the itinerary: appreciate the extensive heritage of Old Town- Historic Center, take in the spiritual surroundings of Ostrow Tumski - (Cathedral Island), don't miss a visit to Panorama of Raclawice Battle, and meet the residents at Wroclaw Zoo & Afrykarium. To see ratings, maps, photos, and more tourist information, go to the Wroclaw trip maker website . You can drive from Berlin to Wroclaw in 4 hours. Other options are to take a train; or take a bus. Expect a daytime high around 22°C in May, and nighttime lows around 10°C. Finish your sightseeing early on the 24th (Fri) so you can drive to Krakow. Let the collections at Auschwitz-Birkenau State Museum and Oskar Schindler's Factory capture your imagination. Popular historic sites such as Cloth Hall (Sukiennice) and Wawel Cathedral are in your itinerary. And it doesn't end there: get to know the fascinating history of Wawel Royal Castle, take in panoramic vistas at Town Hall Tower, take a stroll through Ulica Florianska, and contemplate in the serene atmosphere at Franciscan Church (Kosciol Franciszkanow). To see photos, other places to visit, and other tourist information, read our Krakow road trip planner . You can drive from Wroclaw to Krakow in 2.5 hours. Other options are to take a bus; or take a train. In May, plan for daily highs up to 22°C, and evening lows to 9°C. Finish up your sightseeing early on the 28th (Tue) so you can catch the train to Warsaw. Popular historic sites such as Old Town Market Square and The Royal Castle in Warsaw - Museum are in your itinerary. Let the collections at Warsaw Uprising Museum and POLIN Museum of the History of Polish Jews capture your imagination. The adventure continues: wander the streets of Nowy Swiat, pause for some photo ops at Pomnik Bohaterów Getta, examine the collection at Copernicus Science Centre, and appreciate the extensive heritage of Krakowskie Przedmiescie. To find maps, ratings, more things to do, and more tourist information, refer to the Warsaw online travel route builder . Getting from Krakow to Warsaw by train takes about 2.5 hours. Other options: do a combination of flight and train; or drive. In May, daily temperatures in Warsaw can reach 22°C, while at night they dip to 11°C. Finish your sightseeing early on the 31st (Fri) so you can travel back home.